Because of Wonderful People Like You ~ He Truly is our Victorious Miracle Pup! Best Wishes to Collin in His New "Forever Home"! his good health and Sent messages of encouragement. Because of you, Collin's opportunity for a long life is now a reality. Little Collin entered our Rescue program with his sister & brothers. Unfortunately, we had to remove Collin from our Adoptable page, as his heart murmur did not improve. He was checked several times by our Vet, but time had not helped heal the defect in his heart. Without some type of intervention, Collin will not celebrate his first birthday. We're going to move forward and seek help for Collin because he deserves a chance at life. We plan to have some preliminary tests done in Dallas, then a Veterinary Cardiologist at Texas A&M will meet with Collin and suggest what corrective action needs to be taken. We will post updates on this page as his treatment progresses. UPDATE: 11-22-04 Collin is scheduled for an Echocardiogram & Chest X-Rays on Friday, November 26th. UPDATE: 11-26-04 Collin completed his tests today. The results were not conclusive and are being sent out of state to be analyzed by a Veterinary Cardiologist. We hope to have a more definitive report by December 1st. UPDATE: 11-29-04 We have received the report from the Veterinary Cardiologists regarding Collin's heart murmur. They believe Collin has Pulmonic Stenosis, which is a narrowing of the Pulmonary Valve. This causes enlargement of the Pulmonary Artery. It is common, in these cases, for the dog not to live past 6 - 9 months of age without medical treatment. We are proceeding to have more definitive tests run, such as a Doppler Study, at Texas A&M College of Veterinary Medicine. Once completed, they will be able to suggest the proper treatment for Collin. Better results occur when this problem is addressed early, which is why we are moving forward as quickly as possible. UPDATE: 12-2-04 Collin's Doppler Study at Texas A&M College of Veterinary Medicine will cost an estimated $350. - $450. We are in the process of making the appointment for his test as quickly as possible. If you are able to help with this expense, Collin will appreciate it. Scottie Kingdom Rescue, Inc. is not assisted by any national club or state fund, therefore, we must rely on caring pet owners, such as you, to help defray these costs. UPDATE: 12-3-04 Late Friday afternoon we were contacted by Texas A&M. The Cardiology Department is completely booked until January, 2005, but they are taking Collin on an emergency basis. We have an appointment on Tuesday, December 7th, for his Doppler Study. As soon as we have the results of the test, we will post them here. UPDATE: 12-7-04 Collin was driven to the Texas A&M College of Veterinary Medicine this morning and had the Doppler Study performed. Unfortunately, the test confirmed the Pulmonary Stenosis diagnosis. After meeting with Collin's Cardiologists, it was decided Collin should have the recommended surgery immediately. He is scheduled for surgery tomorrow, December 8th. UPDATE: 12-7-04 Collin’s surgery has been moved up to 9:00AM, December 8th, instead of late in the day. UPDATE: 12-8-04 (8:30AM) Collin slept well last night in the IMC Unit (Intermediate Care) at Texas A&M Veterinary Hospital. Preparation for his surgery begins at 9:00AM. Surgery is scheduled for 10:30AM. ***UPDATE*** 12-8-04 (12 Noon) Collin's surgery has been completed and it was successful, with no major complications!!! He is currently resting in the ICU (Intensive Care) Unit. We should receive another update late this afternoon. UPDATE: 12-8-04 (5:00 PM) Collin is awake now. He remains in ICU so he can be closely monitored. We are driving to Texas A&M Veterinary Hospital tomorrow (Thursday) to meet with Collin's Cardiologists and will receive a full report. There is a chance Collin will return to Dallas with us!!! UPDATE: 12-9-04 (8:00 PM) Collin has returned to Dallas after his successful surgery! He slept the entire time during the drive back to Dallas and was very happy to be back at his foster home. He needs to be monitored for the next few days, then he'll be able to return to normal activities, such as playtime! More information about his surgery will be posted tomorrow. UPDATE: 12-10-04 These are photos of where Collin had his surgery and the people that cared for him. Click each photo to enlarge. Once you view all of the photos, I think you'll agree, that Collin's Doctors and Texas A&M did a fantastic job in repairing Collin's heart. It's nothing short of a miracle. The final bill was $1,916.08 and worth every single penny when you consider that Collin should live a full and healthy life! We are still needing help with Collin's medical bills and would greatly appreciate your assistance. Please scroll down to the Donation button located near the bottom of this page. Anything you can do to help would be gratefully appreciated. The outpouring of support for Collin and his surgery has been so wonderful. We Thank You so very much. UPDATE: 12-24-04 Collin is our "Victorious" Miracle Pup! He is running and playing and doesn't show any signs of his past heart problems. After playtime, when his heart is racing, it's such a miracle to feel an actual heart beat versus the "mushy" sounds of the heart murmur that once was there. UPDATE: 1-1-05 HAPPY NEW YEAR COLLIN ! And a heartfelt THANK YOU to those of you that continue to inquire about Collin's health and offer your Donations towards his care. UPDATE: 2-1-05 Collin continues to be a typical Scottie Pup. He's active and very happy. He plays very well with other Scots. He continues to be on his medication, taken twice daily, and will soon be scheduled for neutering. UPDATE: 2-17-05 Collin is scheduled for neutering today. His heart medication has been adjusted in anticipation of the anesthesia he will receive. His Vet in Dallas, who will perform the surgery, has consulted Texas A&M and received approval for the neutering. UPDATE: 2-17-05 Collin's neutering went well and he is now at his foster home recuperating. COLLIN HAS FOUND HIS "FOREVER HOME"! Scottie Kingdom Rescue, Inc. is committed to saving Collin so he may live a normal & healthy life. He deserves the opportunity to have the Doppler Study performed and obtain a suggested course of action. Because we are funded mostly by wonderful people like you, we are seeking Donations for Collin's Health Care & Doppler Study. 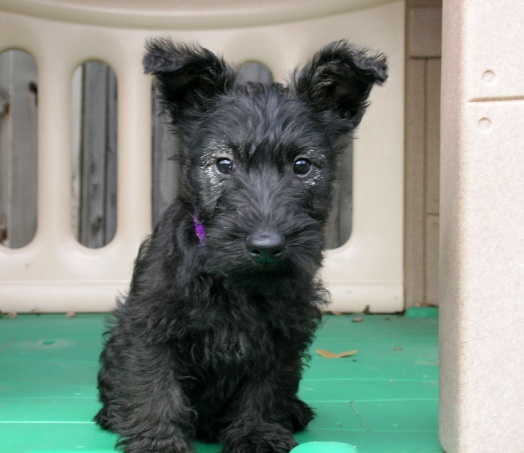 As individuals we can only accomplish so much, but as a loving community of the Scottish Terrier Breed, a formidable effort can be attained by everyone joining together. Please consider helping us ensure Collin will have a long life. Donations can be made via the PayPal button below, or by sending via U.S. Mail. If you would like to direct your Donation to a specific need, we will be pleased to honor your request.